Heat oven to 350°F. Cut 18x7-inch sheet of foil; crimp edges to hold juices from fish. Sprinkle both sides of fish fillets with salt and pepper; place on foil sheet. Set aside. Generously spray half of 15x10x1-inch baking pan, lengthwise, with nonstick cooking spray. Remove dough from can; place seam side down in sprayed side of pan. With serrated knife, cut 4 or 5 (1/2-inch-deep) slashes in top of dough. Bake at 350°F. for 26 to 30 minutes or until loaf is deep golden brown, adding fish on foil to pan during last 20 minutes of baking time. Fish is done when it flakes easily with fork. Cool loaf 5 minutes. Meanwhile, in small bowl, combine butter, chives and mustard; blend well. Cut warm loaf in half lengthwise; cut each half into 4 pieces. Spread top and bottom halves with butter mixture. Layer lettuce, fish, tomato and cucumber on bottom halves; cover with top halves. If necessary, secure each sandwich with skewer or toothpick. Chives are a member of the onion family. The bright green tubular leaves are easily sliced to add mild onion flavor to foods. For frequent use, grow them in a window pot. Prepare chive butter ahead, cover and refrigerate. Allow butter to soften before using. 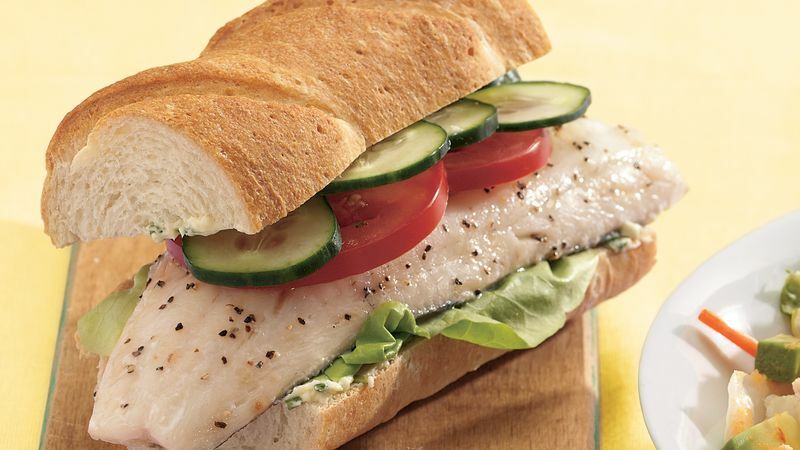 Fish and bread can be baked ahead of time, then reheated briefly before assembling sandwiches.